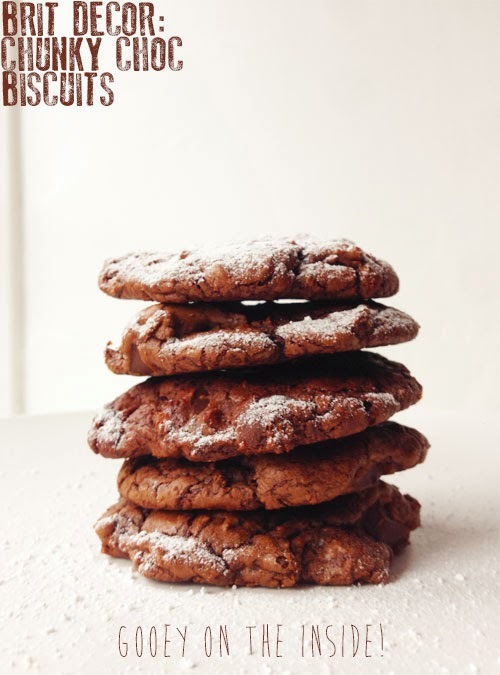 Oh my goodness, how intensely delicious are these biscuits!? The perfect sugary treat for midweek if you are in need of some culinary inspiration to get you through to the weekend. Actually, who am I kidding - these gorgeous chocolate treats are really good for any day of the week, not just Wednesdays! I made the batch above to take to my Sister & Brother-in-Law's house as a little 'thank you for having me' gift and they went down a treat after dinner. Equally, I think I may make these again next time somebody visits for a cuppa - the sweet baked smell in the kitchen is enough to make anyone feel welcome and they are so quick and easy to make. Preheat the oven to around 1750c or Gas Mark 3 and prepare two baking trays with greaseproof paper. Melt around 80 g of the dark chocolate together with the butter then separately mix the sugars, egg and vanilla until you have a smooth paste. Add this to the melted chocolate before sifting in the cocoa powder, flour, salt and baking powder. Roughly chop up the remaining chocolate into chunks and slowly add to the mixture but keep several pieces to one side. Scoop the mixture onto the trays using a teaspoon and sprinkle the remaining choc chunks over the top (be as tidy or as freestyle as you like!). Pop into the oven for 8-10 minutes and then leave to cool before transferring to the fridge. The insides should be nice and soft, which makes the perfect contrast with the slightly harder choc chunks!